This section is under development. Please check back as new content is being added regularly. Thanks! After years of buying collars and having drawers full of rejected ones for various reasons, I am now using this collar exclusively. 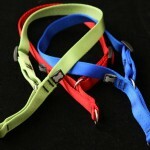 It's well made, gentle, washable, and incorporates the features needed for training and are safe to wear during the day. I use the Limited Slip collar, medium size for boxers.